Making it Yours (MIY), a new feature for Making it Lovely, continues today. I’m following one piece of furniture through several stages in an imagined life and presenting a mood board for each. The first item I’ve been designing around is the Borghese 3-Drawer Dresser. The dresser has had quite a journey, showing up in our fictional girl’s nursery, teenage bedroom,first (tiny) apartment, and first home. Many years have passed but the dresser is still holding up and is now headed with her to her dream home. The table lamp from her last home is here, along with the side table she’s had since her first apartment. Her taste has changed over the years though, and now she leans more toward a subtly glamorous look. A velvet sofa and graceful chair are complemented by silk curtains and a matching pillow. Our girl does still love color and pattern, and that’s brought in with yellow walls, a patterned pillow and a gorgeous patterned rug. 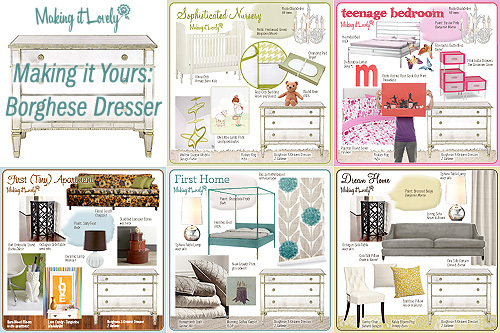 Here are all five of the rooms I’ve designed featuring the Borghese 3-Drawer Dresser. Several items appear in more than one setting, just as you would bring items with you from home to home. I hope you’ve enjoyed the first edition of Making it Yours! Just wanted to let you know how much I’ve enjoyed the feature, especially with a few holdover items and the thoughtfully evolving style. Even the semi-cringe-worthy moments in “teenage” and “tiny” add to the realism. Your mood boards are gorgeous! 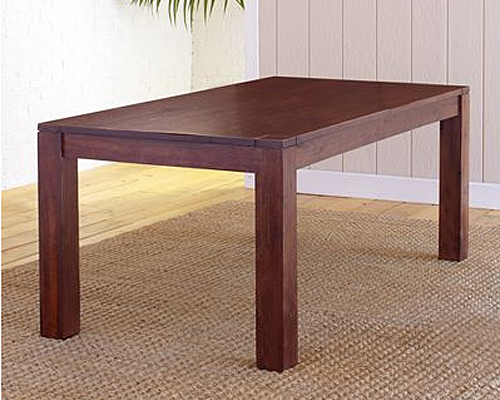 They are so well put together and your designs are very practical and realistic. I too have enjoyed the journey. 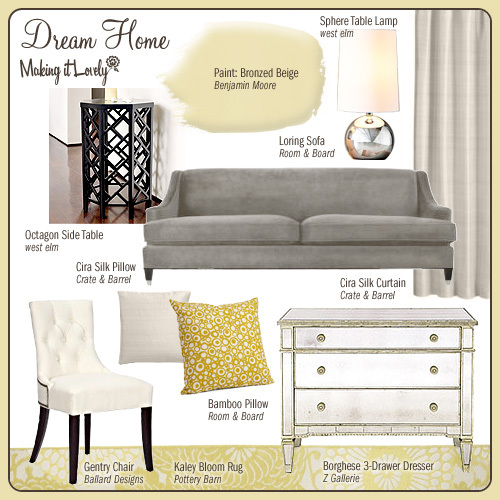 I love the mix of textures with the gray and yellow color combo of the “Dream Home” room. Can’t wait to see future editions of MIY. I loved, loved, loved, the MIY! Now I have a request/idea. My husband and I are looking to buy a 2 bedroom condo in the city (we currently have a one bedroom), but they all look the same! What ideas would you have to make these generic condos look great?? If you ever start a side gig in home design, I’m signing up as a client. Loved this feature, love your designs. Tres Chic! My favorite mood board! Absolutely beautiful! fabulous! i loved seeing the progression… can’t wait to see this new feature again! I really loved this feature and enjoy your blog. Thanks for providing a nice break from office craziness to dream a little bit! Absolutely lovely. I really don’t know which mood board I liked the best—they are all amazing!!!! I love, love, love your new feature, Nicole! You’ve done a fabulous job. You’ve even got me thinking I need that velvet sofa. Fab new series! I’ve loved following along – and drooling over many of your choices! I’ve been lurking on your blog for quite some time now and have to tell you how seriously talented you are, this MIY feature just gives more evidence to what was already the general consensus. You need to be on HGTV! You’re awesome. I really enjoy and am inspired to action by your design boards! Am absolutely loving this feature! 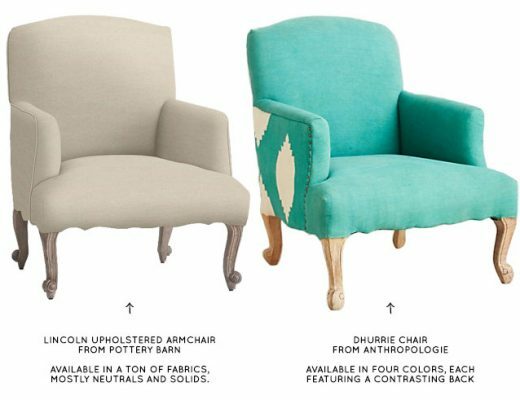 Just wish I lived in the US to get access to the amazing furniture, but I love being inspired by your blog and by other contributors! I am delurking and absolutely love your blog. The MIY series is amazing, it has inspired me to actually purchase some great “heirloom” pieces that I can take with me and pass down to my children someday. Seriously great feature ~ this blog rocks! oh guess what?! The Borghese dressers are the nightstands in the new house on Tori and Dean Home Sweet Hollywood! You can see them in the episode about their housewarming party. This feature is fantastic! I really love the last room. I still cannot get enough of that dresser. I think a piece like that really stands out in a bedroom. LOVE the different rooms you put together! I love this! it was such a clever idea :-) I have two mirrored night stands… I wonder how they will take the transition through the ages. Please keep up the MIY. I have absolutely loved it. While all the designs were chic, the nursery was by far my favorite!! What a great new feature. I’ll be looking forward to more MIY. What a great feature! I love each and every room you’ve put together, you’re so talented! love these posts…thanks for doing this! LOVE the ‘making it yours’ boards. so cool! and that sofa from room & board? awesome. i want it (with tufting of course). great finds, my dear! you always have the best resources. I love MIY as well. So well done and so very inspirational. I’m so glad you all enjoyed the new feature! I had a LOT of fun with it, so I’ll definitely be doing more! i love love love this feature! can’t wait to see the next one! I’ve been reading your blog for a while now and love it! It’s cheerful and I can’t wait to see what projects you’re cooking up. I loved this idea and can’t wait to see any more installments. Also I love your monthly style boards and any mood boards you do up. Just wanting to say I love your blog! I love the idea of MIY. I loved the whole series. I hope more to come! Thanks a lot! 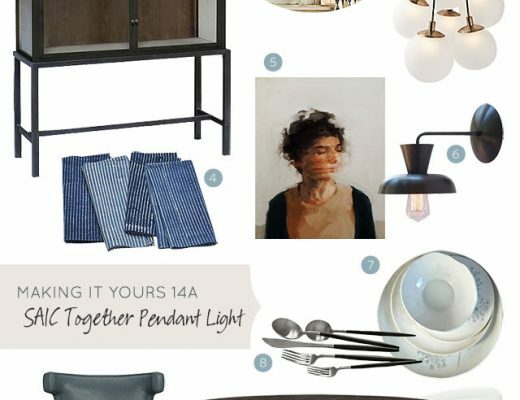 enjoyed reading your blog lately after a link I followed from my other favourite Decor8. Such a fantastic series! I look forward to seeing the next one! You have great style + charm – thanks for the great site! I love your quick “magazine style” boards. Do you use a particular software or something like photoshop or powerpoint? I love your pick for the sofa. I have been eyeing this sofa for about a month now. I can not figure out which color you choose for the board. Is it grey or charcoal? I also wanted to tell you that I absolutely love this site, I just stumbled across it yesterday and I can’t get enough of it. I found it through Alkemie’s blogsite. Keep up the good work! Love your mood boards. Very nice.